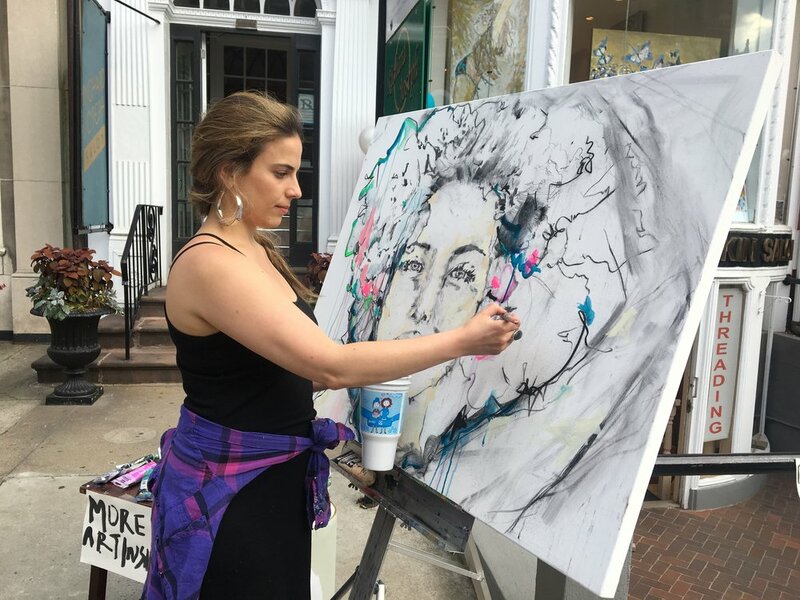 Stephanie Saunders, a graduate of the School of the Museum of Fine Arts Boston, is a visual artist and owner of Stephanie Saunders Art Gallery. The gallery is located at 164 Newbury Street, Boston’s iconic shopping street and exclusively sells her own paintings. The artwork of Stephanie Saunders tells the story of becoming whole. It is her intention for her art to be inspiring, uplifting, and to kindle joy in the viewer. Her artistic process and the painted imagery are deeply inspired by the transformative principle of nature and the inseparable relationship between creation and destruction. Her work is greatly influenced by extensive studies in Eastern philosophy and the Devine feminine principle. . . Her large and colorful paintings are intended to transport the viewer to a state beyond the ordinary, while simultaneously including and embracing the most basic and universal aspects of the human condition. Her often large mixed media paintings celebrate the female form and frequently utilizing the figure and various symbols as metaphors for a larger discussion and visual inquiry around themes of personal transformation, beauty, freedom, and spiritual realization.